Boy your m300 is heavy my F3 is 425 lb but its all good. The reason the weight is asked is because they try and balance the weight with in the cargo area. A lot of passengers dont know most airlines make more money in business cargo that is flying below. How we load is I roll my chair in to the jet way then on to the plane and with the front wheel drive I can turn so I am facing the isle and my Wife is able to help me transfer. On trips where she is tired or we have a lot of carry on I will use a isle chair and they the opps agents will left me in to the seat then they will back out the chair. The trick is when you check in that agent should be giving you a tag and tag your chair to "bring to the gate tag"
Before you land tell the flight attendants to radio the ground crew and make sure that chair is brought back up when you land. Vs landing and they forgot, be proactive they have access to contact the ground crew while flying. By the way we flew a lot with my m300 its a tank never had any damage or shroud damage to the paint! I dont use a wheelchair so never had that experience, but I know a lot in our community over think and worry. Not to say things dont happen but with a little preparedness and not be rushed damage is minimal and always fixable free from the airlines. Last edited by RollPositive; 01-30-2017 at 02:27 PM. 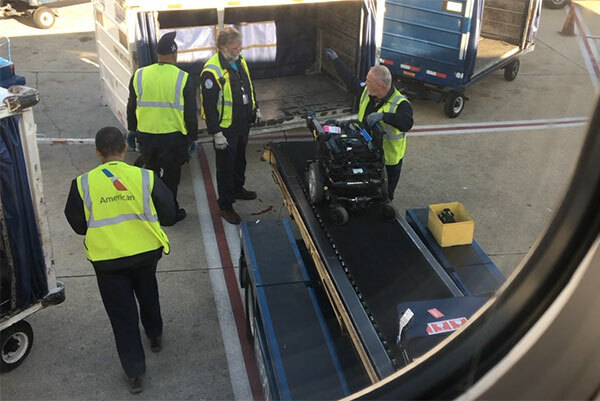 "Roll Positive", I certainly appreciate your optimism re: flying, and having laws to protect against damage, but that does not much comfort when you arrive to your vacation destination that you've planned months in advance, to find your chair has been damaged and your plans suddenly change. I've only flown 6 times since my accident, and twice had damage to my chair, and it was not due to lack of preparation or discussion with airline staff. I am having trouble seeing how you are able to roll your chair onto the plane, and then transfer. The several flights I've taken most recently there has been a height difference between the jetway and plane entrance, so there was no way I would be able to drive onto the plane. Last year thanks to rewards points I was able to upgrade to business class from JFK to SFO on an AA321T, which has the lay flat seats. The aisle is wide, where I thought it possible to be transferred directly from my chair to seat. Unfortunately again the entrance height between jetway and plane was too great. Even so, the gate rep made it sound like even if I could've driven my chair onto the plane to then be transferred, they wouldn't allow it. Interesting that you give them the option of using the joystick. Especially with the F3 having the ability to turn the controller inward, do you trust that they will flip it in themselves? Finally, interesting about the x5. I had come close to purchasing an x8 several years ago, but had wondered how I would take it anywhere. It may be even heavier then the F3! Have to agree with "landrover." I admire your optimism and faith in airline policy and personnel. But, I'm just not as sanguine as you are, "Roll Positive." Flying with a manual chair was always a nail biter. But, flying with a power chair ties my stomach in knots. I cant tell you how many times I talk to people at the airport or on a plane that see us load, unload, get luggage, even get a cab... there questions are pretty much the same...how, what and where can you travel with a power chair. Everyone seems to know someone that have talked themselves out of traveling for the same reasons. Worried about damage, not understanding that the airlines are really there to help not hinder our community. The 1st years it was a struggle but we worked close with Southwest corporate in ways to mitigate damage and improve the customer experience. We have been traveling successful for 18 years and I think the last damage we had was 6 + years ago on a flight to Las Vegas with my x5 they sheared the armrest off then brought the chair to the jet way and said" Did you fly with these off? What happen was the agent was to busy and didnt listen that the chair was to ride to fit through the jetway door and shoved it though and off came the armest! So they had a cab take us to a DME by the airport and with in 2 hours it was fixed free of charge. So I get what your saying how damage can mess up a trip but the memories of the trip far out way any repairs. I think one of the best stories is with a friend here HACKNSACK he and his Wife to be reached out to me they planed to get married and wanted to go on a honeymoon to Las Vegas so we worked out a plan, they had my phone number in case if any issues and next thing I know I see pictures of he and his Wife on board read for Las Vegas!! Did they have a few issues they did but not damage but if you ask them I bet there memories of a great trip out weighed the challenges they had on the plane. Landrover before the F3 I had a m300, then before that a Pride Edge(junk) even the x5 as big as it is rolls on to the plane then turns semi right with the F3 allowing me to turn the full 90 degrees. We lift the armrest up on the seat and my chair and my Wife helps me pivot to the 1st seat. One I am there she helps me move over to the window ( I have had people with luggage hit me or luggage fall out of the over head. Once I am in and comfortable she backs my chair out and the ramp supervisor takes it. When its loaded they will come back up and let us know or thumps up if we are watching. We always remind them to radio ahead to bring it to the gate and to relay how they loaded it. The biggest help is not to be rushed, work with the ground crew and then relax and let them do the work. Landrover I make sure we show that specific person how the joystick moves in to the inside part of the chair, we show them how the seat back leans back with the buttons, we show him how to free wheel and have them repeat the steps to us. Once in a blue moon if they are rushed they dont listen so we stop and say..Hey I dont think your listening and thats a problem and here is why. Have to be assertive because this is where damage happens. On your two trips what damage did you have and did you report it when it happen. That is the key to getting it fixed fast. GJNL Take s short trip and try it, it might put your mind at easy. I've technically taken 12 flights, damage on 2. The first was years ago, on a return flight. I didn't notice until already home. It appears the chair may have been dropped, which bent the axle of the chair. The other was on my most recent trip. They either purposely disconnected some wires, or did so by accident, but regardless the chair was in "drive lock-out" because it thought the chair was tilted back too far, although it wasn't. Maybe you could make an updated video for us with your process. Did you have them fix it? One of the biggest things we do is when my chair or chairs are brought up we double check for any damage. I would think a bent or broken axel you would notice as you start to roll? One of the reasons to meet with the ramp supervisor is to show them how your chair breaks down and in my case a reminder the chair and how to turn it off because wires no longer can be disconnected nore do they have to be! I can do an upgraded video again but its pretty much the same process. Shorter trips we transfer with my Wife helping ( hour to hour 1/2 trips) Longer trips (2 hours +) we use isle chair and sit in the 2nd row for a table access. I understand that most airports have ramps or lifts to assist in loading the chair onto the conveyor belt to load into the plane (at least that is what I was told), but IF the chair needs to be lifted, where do you advise they lift from (in this case I'm referring specifically to the Permobil F3). I imagine one of the locations would be in the area where the rear caster arms are, but I'm not sure where they would lift from in the front. I can't imagine lifting from the seat pan would provide enough leverage. We don't necessarily recommend that the chair be lifted, but we do understand certain circumstances where it may need to be done. The chair should never be lifted by the seating system. If the chair must be lifted, you may have them use the tie downs hooks or have a strap go underneath the chassis. Let us know if you need anything else. Thanks!